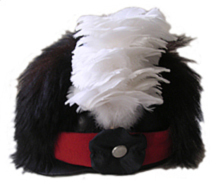 These hats varied in style and design from one British regiment to another. We use heavy, winter bear pelt, leather and wool for these. You will have to tell us what your regiment's hats looked like. A hat cord NOT included. Please provide your head size when ordering. 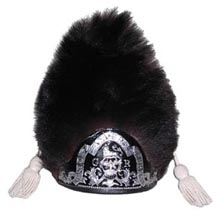 NOTE: The only difference between these hats and the Grenedier hats is that these are two inches shorter and have the musicians' hat plate.